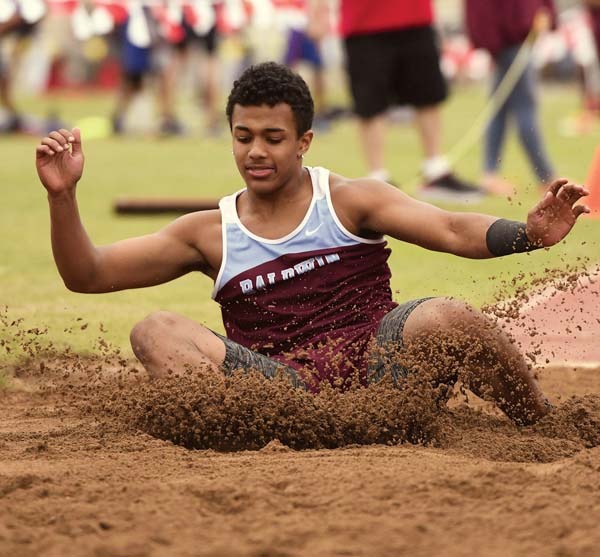 KAHULUI — The Baldwin High School boys and Seabury Hall girls track and field teams spent much of Saturday night’s Maui Interscholastic League championship battling themselves on their way to yet another team title. The Bears went one, two, three in four events, while the Spartans swept the three distance races at the Yamamoto Track & Field Facility. 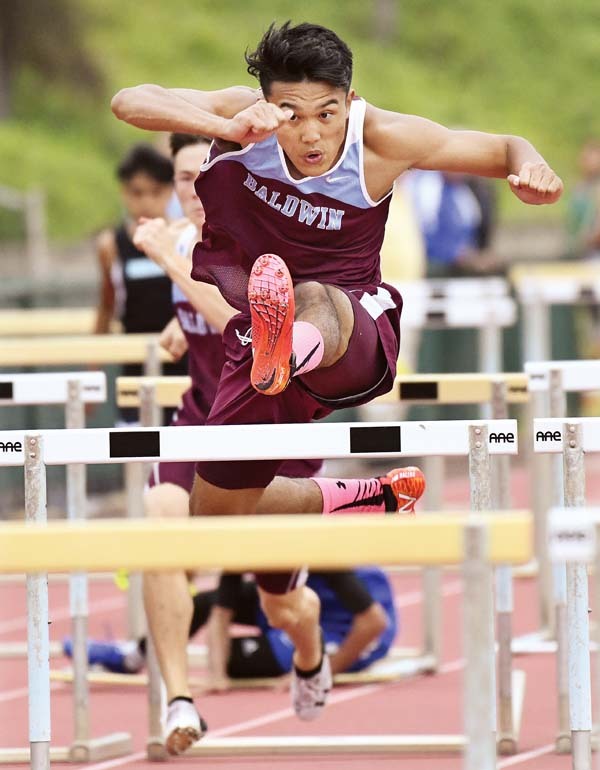 It was Baldwin’s 13th straight MIL boys title and Seabury Hall’s sixth consecutive girls crown. Cadiz and the Spartans’ Veronica Winham captured four gold medals each. Cadiz won both hurdle events and both relay races. Winham swept the three distance races and anchored the winning 1,600-meter relay team. Baldwin had five other individual winners: Darrian Cremer finished first in the 200 with a time of 22.50 seconds; Kolbe Fontanilla took the 800 (2:06:09); Shawn Silva won the high jump (6 feet, 2 inches); Edward Omine claimed the pole vault (14-6); and Bishop Wickes captured the triple jump (42-1). Baldwin finished with 207 points. King Kekaulike was second with 91. Cremer’s win came as a surprise and was his first individual gold after taking third in the 100. He also surprised coaches Saturday by revealing to them he only has one kidney. The Spartans had three other individual winners: Maile Dougherty won the 400 (1:00:73), Ameera Waterford claimed the 100 hurdles (16.11) and Taysia Pimentel captured her school’s first gold in the shot put (34-6). Seabury Hall finished with 155 points. Baldwin took second with 79. Spartans coach Bobby Grossman said he was happy with how his entire team contributed to the victory. Seabury will defend its state team title May 11-12 at Kamehameha Kapalama. 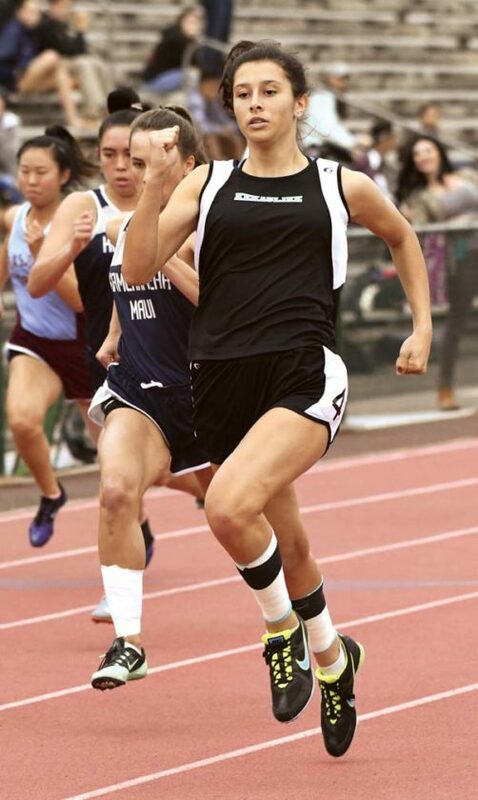 Other notable individual performances included three gold medals by King Kekaulike freshman Isabella Dillon, who won the 100 and 200, and was on Na Alii’s winning 400 relay team. Dillon, a soccer player, said her coach initially encouraged her to try out for the team. Dillon did not know how she will top Saturday’s performance for the rest of her MIL career. The boys competition had two photo finishes, in the 400 and 1,500 races. King Kekaulike’s Micah Womack (51.55) narrowly beat the Bears’ Elliot Tom by four-hundredths of a second, and Maui Prep’s Damon Wakefield (4:17:00) squeaked by Na Alii’s Eden MacKinnon by one-hundredth of a second. Womack missed a couple meets this season due to tendinitis in both knees and a sprained quad. It was the senior’s first MIL gold. Seabury Hall’s Isaiah Payne captured his second straight gold in the 100 in 10.90 second. His younger brother, Noah, took second. Team standings–1. Seabury Hall 155, 2. Baldwin 79, 3. Kamehameha Maui 73, 4. King Kekaulike 67, 5. Lahainaluna 44, 6. Maui High 40, 7. Molokai 19, t8. Kihei Charter 9, t8. Maui Prep 9. 100 meters–1. Isabella Dillon, King Kekaulike, 12.78; 2. Olivia Solar-Miller, Maui High, 12.99; 3. Katarina Hokulani Panoke, Kamehameha Maui, 13.00; 4. Kiana Over, Kamehameha Maui, 13.37; 5. Erica Pilotin, Seabury Hall, 13.58; 6. Kiralynn Francisco-Pu, King Kekaulike, 13.64; 7. Mindy Kimura, Baldwin, 13.67; 8. Keeya Bicoy, Molokai, 13.74. 200–1. Isabella Dillon, King Kekaulike, 26.39; 2. Olivia Solar-Miller, Maui High, 26.93; 3. Katarina Hokulani Panoke, Kamehameha Maui, 27.07; 4. Chiarra Clark, Lahainaluna, 27.95; 5. Keeya Bicoy, Molokai, 28.59; 6. Kaleigh Trice, Kihei Charter, 29.22; 7. Kiana Over, Kamehameha Maui, 29.32; 8. Mindy Kimura, Baldwin, 29.63. 400–1. Maile Dougherty, Seabury Hall, 1:00:73; 2. Nanea Estrella, Lahainaluna, 1:01:88; 3. Teani Arakawa, King Kekaulike, 1:03:51; 4. Isabella Theobald, Lahainaluna, 1:04:57; 5. Elly Swartz, Seabury Hall, 1:07:07; 6. Kristi Echiverri, Maui High, 1:08:03; 7. Cecilia Buckingham, King Kekaulike, 1:08:06; 8. Precious Rayray, Baldwin, 1:08:91. 800–1. Veronica Winham, Seabury Hall, 2:21:14; 2. Chloe Gangnath, Seabury Hall, 2:21:69; 3. Kallalei Ryden, Seabury Hall, 2:25:35; 4. Kalea Acevedo, Lahainaluna, 2:33:53; 5. Skyler Sands, King Kekaulike, 2:35:67; 6. Nadia Toscano, King Kekaulike, 2:38:01; 7. Alea Davis, Molokai, 2:38:99; 8. Julia Knowles, Baldwin, 2:44:07. 1,500–1. Veronica Winham, Seabury Hall, 4:52:29; 2. Chloe Gangnath, Seabury Hall, 4:53:58; 3. Darby Mulligan, Seabury Hall, 5:09:50; 4. Julia Knowles, Baldwin, 5:19:00; 5. Alea Davis, Molokai, 5:28:21; 6. Olivia Bozich, Maui Prep, 5:52:68; 7. Heidi Mahan, Maui Prep, 6:01:39; 8. Trinity Fox, Maui High, 6:08:60; 9. Kaleimaile Eldredge, Baldwin, 6:52:62; 10. Araeli Prado-Rodriguez, Baldwin, 7:02:23. 3,000–1. Veronica Winham, Seabury Hall, 10:5:43; 2. Kallalei Ryden, Seabury Hall, 11:03:40; 3. Darby Mulligan, Seabury Hall, 11:22:49; 4. Trinity Fox, Maui High, 13:18:86; 5. Olivia Bozich, Maui Prep, 13:47:55; 6. Kaleimaile Eldredge, Baldwin, 15:36:00. 100 hurdles–1. Ameera Waterford, Seabury Hall, 16.11; 2. Sascia Campos-Ewaliko, Baldwin, 16.94; 3. Mia Daly, King Kekaulike, 17.08; 4. Jaime-Lee Aruda, Baldwin, 17.09; 5. Erika Preseault, Seabury Hall, 17.20; 6. Erin Taketa, Baldwin, 18.78; 7. Kami Echiverri, Maui High, 24.28; 8. Gracie Marchesi, Lahainaluna, 29.40. 300 hurdles–1. Mia Daly, King Kekaulike, 49.31; 2. Erika Preseault, Seabury Hall, 49.84; 3. Ameera Waterford, Seabury Hall, 50.32; 4. Faith Bonacorsi, Kamehameha Maui, 50.43; 5. Gracie Marchesi, Lahainaluna, 51.13; 6. Bella Lallo, Seabury Hall, 52.60; 7. Erin Kobashigawa, Baldwin, 53.44; 8. Kami Echiverri, Maui High, 57.57. 400 relay–1. King Kekaulike ‘A’ (Teani Arakawa, Kiralynn Francisco-Pu, Isabella Dillon, Mia Daly) 51.35, 2. Kamehameha Maui ‘A’ 51.88, 3. Lahainaluna ‘A’ 51.97, 4. Baldwin ‘A’ 52.35, 5. Maui High ‘A’ 53.28, 6. Seabury Hall ‘A’ 54.04, 7. Molokai ‘A’ 56.14. 1,600 relay–1. 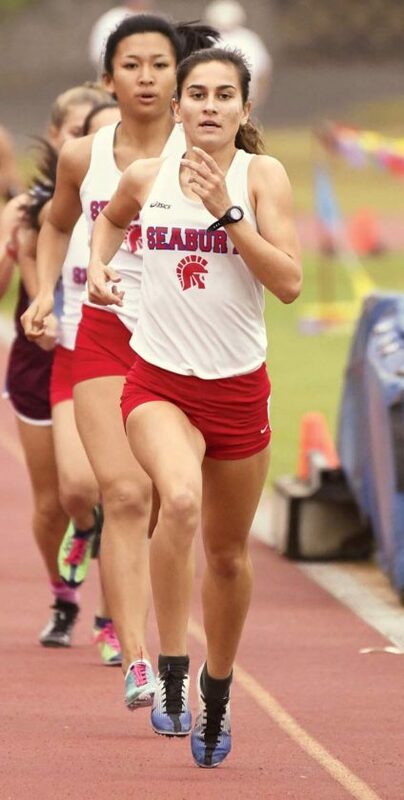 Seabury Hall ‘A’ (Erika Preseault, Maile Dougherty, Chloe Gangnath, Veronica Winham) 4:13.84, 2. Lahainaluna ‘A’ 4:19.68, 3. King Kekaulike ‘A’ 4:24.37, 4. Kamehameha Maui ‘A’ 4:24.41, 5. Baldwin ‘A’ 5:10.83. High jump–1. Keely Logan, Kamehameha Maui, 5-0; 2. Alisha Dingman, Kihei Charter, 4-10; 3. Sydney Snyder, Maui Prep, J4-10; 4. Jaime-Lee Aruda, Baldwin, 4-8; 5. Sienna Bigelow, Seabury Hall, 4-6; 6. Taye Mowat, Molokai, J4-6; t7. Kristi Echiverri, Maui High, 4-4; t7. Keeya Bicoy, Molokai, 4-4; 9. Precious Rayray, Baldwin, J4-4; 10. Hunter Balberdi, Baldwin, J4-4. Pole vault–1. Tianna Powell, Baldwin, 10-6; 2. Alexis Asato, Baldwin, 9-6; t3. Erin Mukai, Baldwin, 8-0; t3. Jennea Nagura, King Kekaulike, 8-0; 4. Sofia Salvatierra, Kamehameha Maui, J8-0; 5. Lily Gavagan, Kamehameha Maui, J8-0; 6. Alayna Evans, Kamehameha Maui, J7-6. Long jump–1. Kiana Over, Kamehameha Maui, 17-5; 2. Sascia Campos-Ewaliko, Baldwin, 16-3.25; 3. Erica Pilotin, Seabury Hall, 15-10.50; 4. Sela Panuve, Baldwin, 15-9.50; 5. Nanea Estrella, Lahainaluna, 15-7.25; 6. Maile Dougherty, Seabury Hall, 15-4.50; 7. Sophia Horovitz, Seabury Hall, 14-10; 8. Cortney Inamasu, Maui High, 14-4.50. Triple jump–1. Sela Panuve, Baldwin, 35-10; 2. Maile Dougherty, Seabury Hall, 35-5; 3. Sascia Campos-Ewaliko, Baldwin, 34-3; 4. Sienna Bigelow, Seabury Hall, 32-2; 5. Isabella Theobald, Lahainaluna, 31-2.50; 6. Cortney Inamasu, Maui High, 30-11; 7. Charlie Abreu, King Kekaulike, 30-9.50; 8. Erica Pilotin, Seabury Hall, 30-7. Shot put–1. Taysia Pimentel, Seabury Hall, 34-6; 2. Saje Pedroza-Kanemitsu, Kamehameha Maui, 34-1; 3. Kiana Maghanoy, Maui High, 32-0.50; 4. Tai-Li Tangatailoa, Molokai, 29-10; 5. Jaslynne Kanoeau, Lahainaluna, 27-10; 6. Delissa Rano, Kamehameha Maui, 27-0; 7. Haile Evangelista, Maui High, 26-3.50; 8. Lilinoe Andrade-Santana, Baldwin, 25-7.50. Discus throw–1. Tai-Li Tangatailoa, Molokai, 99-6; 2. Delissa Rano, Kamehameha Maui, 93-1; 3. Erikah Dowells, Maui High, 91-10; 4. Haile Evangelista, Maui High, 90-8; 5. Jaslynne Kanoeau, Lahainaluna, 89-6; 6. Saje Pedroza-Kanemitsu, Kamehameha Maui, 86-9; 7. Taysia Pimentel, Seabury Hall, 85-9; 8. Kalia Kapisi, Maui High, 84-0. Team standings–1. Baldwin 207, 2. King Kekaulike 91, 3. Kamehameha Maui 61, 4. Lahainaluna 44, 5. Maui High 37, 6. Seabury Hall 32, 7. Maui Prep 12, 8. Kihei Charter 7. 100–1. Isaiah Payne, Seabury Hall, 10.90; 2. Noah Payne, Seabury Hall, 11.19; 3. Darrian Cremer, Baldwin, 11.32; 4. Michael Rebolledo, Baldwin, 11.60; 5. Brayden Reys-Sojot, Baldwin, 11.67; 6. Tyer Baldonado-Kaleiopu, Kamehameha Maui, 11.89; 7. Isaiah Richards, Maui High, 11.93; 8. Ty Tau-a, Kamehameha Maui, 12.15. 200–1. Darrian Cremer, Baldwin, 22.50; 2. Micah Womack, King Kekaulike, 23.25; 3. Michael Rebolledo, Baldwin, 23.58; 4. William Yudis, King Kekaulike, 23.85; 5. Ryan Danovich, Maui High, 24.13; 6. Zachary Genobia, Kamehameha Maui, 24.34. 400–1. Micah Womack, King Kekaulike, 51.55; 2. Elliot Tom, Baldwin, 51.59; 3. Zachary Genobia, Kamehameha Maui, 54.28; 4. Joshua Tanicala, King Kekaulike, 55.22; 5. Kiva Herrera, King Kekaulike, 56.14; 6. Ryan Danovich, Maui High, 56.40. 800–1. Kolbe Fontanilla, Baldwin, 2:06:09; 2. Nicholas Stevenson, King Kekaulike, 2:06:68; 3. Griffin Hardy, King Kekaulike, 2:07:26; 4. Jonathan Merchant, Seabury Hall, 2:07:78; 5. Damon Wakefield, Maui Prep, 2:13:23; 6. Edward Omine, Baldwin, 2:19:01. 1,500–1. Damon Wakefield, Maui Prep, 4:17:00; 2. Eden MacKinnon, King Kekaulike, 4:17:01; 3. Hunter Shields, Maui High, 4:18:07; 4. Griffin Hardy, King Kekaulike, 4:22:08; 5. Jeremy Rivera, King Kekaulike, 4:36:13; 6. Gian Santiensanio, Kihei Charter, 4:42:52; 7. Adolfo Cruz-Garcia, Lahainaluna, 4:45:13; 8. Brandon Kwock-Fukuda, Baldwin, 5:17:88. 3,000–1. Adam Hakola, Maui High, 9:37:29; 2. Connor Kong, Maui High, 9:46:56; 3. Eden MacKinnon, King Kekaulike, 10:01:16; 4. Ansel Newman, King Kekaulike, 10:05:83; 5. Jonathan Merchant, Seabury Hall, 10:27:11; 6. Hunter Shields, Maui High, 10:36:46; 7. Adolfo Cruz-Garcia, Lahainaluna, 10:41:20; 8. Joseph Musto, King Kekaulike, 10:43:67; 9. Pohaku Kepler, Kihei Charter, 11:31:99; 10. Jacob Black, Baldwin, 11:51:88; 11. Johann Flores, Lahainaluna, 12:15:08. 110 hurdles–1. Rey Cadiz, Baldwin, 14.73; 2. Tyler Adachi, Baldwin, 16.05; 3. Bishop Wickes, Baldwin, 16.14; 4. CJ Hamasaki, Kamehameha Maui, 18.33; 5. Hadriel Vasquez-Abarca, King Kekaulike, 19.33; 6. Isaiah Henderson, King Kekaulike, 22.10. 300 hurdles–1. Rey Cadiz, Baldwin, 39.14; 2. Bishop Wickes, Baldwin, 42.68; 3. Tristan Aplanalp, Baldwin, 44.45; 4. Hadriel Vasquez-Abarca, King Kekaulike, 48.40; 5. Keanu Rindlisbacher, Kamehameha Maui, 49.32; 6. Isaiah Henderson, King Kekaulike, 49.53; 7. Mike Simon, Maui High, 50.19; 8. Kawika Regidor, King Kekaulike, 53.35. 400 relay–1. Baldwin ‘A’ (Joshua Romero, Darrian Cremer, Brayden Reys-Sojot, Rey Cadiz) 43.45, 2. Seabury Hall ‘A’ 44.29, 3. Kamehameha Maui ‘A’ 45.86, 4. Maui High ‘A’ 47.45. 1,600 relay–1 Baldwin ‘A’ (Michael Rebolledo, Nathaniel Cremer, Elliot Tom, Rey Cadiz) 3:31.06, 2. King Kekaulike ‘A’ 3:34.17, 3. Kihei Charter ‘A’ 3:40.23, 4. Kamehameha Maui ‘A’ 3:43.88, 5. Maui High ‘A’ 4:02.74. High jump–1. Shawn Silva, Baldwin, 6-2; 2. Joshua Romero, Baldwin, 5-10; 3. Nathaniel Cremer, Baldwin, 5-8; t4. Caleb Sylva, King Kekaulike, J5-8; t4. Isaiah Tanner, Lahainaluna, J5-8. Pole vault–1. Edward Omine, Baldwin, 14-6; 2. Shawn Silva, Baldwin, 12-6; 3. Matthew Ideoka, Baldwin, J12-6; 4. Matthew Kaimiola, Kamehameha Maui, 11-6; t5. Alema Ebana, Kamehameha Maui, 9-6; t5. Nikolas Acain-Licata, Maui High, 9-6; t5. Kainalu Estrella, Lahainaluna, 9-6. Long jump–1. Isaiah Tanner, Lahainaluna, 22-1.75; 2. Darrian Cremer, Baldwin, 21-5; 3. Michael Rebolledo, Baldwin, 21-2.50; 4. William Yudis, King Kekaulike, 19-4.50; 5. Arik Mendoza, King Kekaulike, J19-4.50; 6. CJ Hamasaki, Kamehameha Maui, 19-3.75; 7. Joshua Romero, Baldwin, J19-3.75; 8. Joshua Tanicala, King Kekaulike, 18-7.75. Triple jump–1. Bishop Wickes, Baldwin, 42-1; 2. Isaiah Tanner, Lahainaluna, 41-0; 3. Christian Reinhardt, Baldwin, 40-9; 4. Nathaniel Cremer, Baldwin, 39-10; 5. Ebi Cuello, Maui High, 36-11; 6. Kainoakeola Sanchez, Kamehameha Maui, 36-2; 7. Mark Berzabal, Maui High, 36-1; 8. Jaeden Magbual, Maui High, 35-7. Shot put–1. Micah Au-Haupu, Kamehameha Maui, 51-5.50; 2. Allen Purdy, Kamehameha Maui, 46-11; 3. Jason Kaya, Baldwin, 46-1.50; 4. Koa Evalu-Robinson, Lahainaluna, 44-1; 5. Apakasi Felemi, Lahainaluna, 43-2.25; 6. Malachi Semo, Baldwin, 42-11; 7. Francisco Xavier Ponce, Maui High, 41-10.50; 8. Samiu Oto, Baldwin, 41-9.25. Discus throw–1. Apakasi Felemi, Lahainaluna, 143-6; 2. Micah Au-Haupu, Kamehameha Maui, 133-0; 3. Koa Evalu-Robinson, Lahainaluna, 126-0; 4. Kialoa Rano, Kamehameha Maui, 116-2; 5. Henry Kahiamoe, Baldwin, 110-0; 6. Akulia Kolomatangi, Baldwin, 109-10; 7. Allen Purdy, Kamehameha Maui, J109-10; 8. Francisco Xavier Ponce, Maui High, 99-3.